by Eric J. Hentges, Ph.D., Executive Director; Dorothea K. Vafiadis, M.S., Nutritionist; and Colette I. Thibault, M.S., R.D., L.D., Nutritionist, Center for Nutrition Policy and Promotion, U.S. Department of Agriculture, Alexandria, Va.
Obesity has risen at an epidemic rate in the United States during the past 20 years. Its challenge did not appear overnight, and its scourge will not be resolved quickly or by a singular event. Reversing its upward trend requires collaboration among government and private sectors, as well as a commitment to action by communities across the country. It also demands that each of us assume responsibility for promoting the nation’s health. One important way to do this is by implementing the new Dietary Guidelines for Americans 2005. 1. Be physically active each day. 2. Eat a nutritious diet. 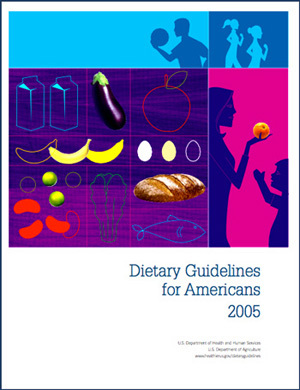 The government’s Dietary Guidelines for Americans 2005 directly support two of these strategies while setting forth specific, science-based recommendations to help the public reach target nutrition levels, promote healthier lifestyles and reduce risk for major chronic diseases such as high blood pressure. Is There Any Hope of Preventing Childhood Obesity? by Kelly D. Brownell, Ph.D., Professor and Chair of Psychology, Professor of Epidemiology and Public Health, and Director of the Rudd Center for Food Policy and Obesity, Yale University, New Haven, Conn.
Childhood obesity is on the rise. Currently, some 22 million children under the age of 5 are estimated to be overweight worldwide. Rates of childhood obesity over the past 30 years in the United States alone have doubled in children ages 2 to 5 and have tripled in those ages 6 to 11. In fact, for the first time in America’s history, U.S. children are expected to lead shorter lives than their parents. Countries across the globe are reporting alarming increases in childhood obesity (above chart). Today, there are clinics for treating obese children in China, and in many developing countries, obesity will surpass malnutrition as the chief nutrition crisis. Reaching epidemic levels in some parts of the world, the problem is also driving the development of debilitating and life-threatening conditions — notably chronic heart disease, type-2 diabetes, gall-bladder disease and large-bowel cancers. Boys born in 2000 in the United States, for example, now stand a 30 percent chance of developing diabetes; the equivalent figure for girls is even higher, at 40 percent — and, even then, only if increases in obesity level off.